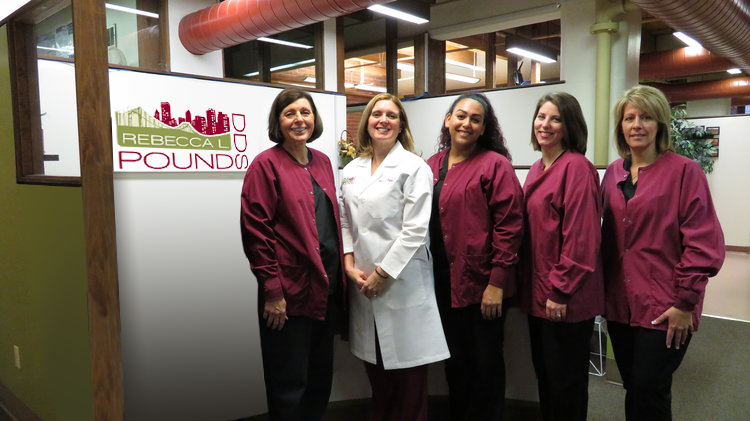 If you are looking for a dentist in Pittsburgh, we invite you to contact our staff of experienced and friendly professionals. In our office you will find a wide range of dental services that reflect our office philosophy, which emphasizes preventive dentistry. Our services include cosmetic dentistry, children’s dentistry, bioesthetic dentistry, and general dentistry. Use our website to learn more about our services, and feel free to contact us if you have any questions or concerns. Dr. Pounds and her staff believe in preventing infection and decay by catching problems before they become serious. By this means, we help you preserve your smile and avoid more intense and invasive treatments wherever possible. Additionally, we provide care that's good for the long term health of your mouth. Our treatments are conservative and are aimed at helping your teeth resist daily wear. Our office can be found in downtown Pittsburgh on the third floor of the historic Hartley-Rose building. Here, we’ve created a warm and friendly atmosphere that will help you feel comfortable visiting the dentist. Our goal is to help you feel calm and confident as you move forward to improve your oral health. Our office is also equipped with state-of-the-art technology to ensure that you receive the best care available. Each member on our team has the experience necessary to give you a beautiful, lasting smile. Dr. Pounds is also one of the few dentists in the state certified to practice bioesthetic dentistry. It is no surprise that she has been recognized as one of Pittsburgh's Top Dentists by Pittsburgh Magazine. Our dedication to patient satisfaction can be seen in our schedule. We have early morning, evening, and Saturday appointments available. We’re also glad to see patients on their lunch hour at our convenient location. In the event of a dental emergency, we'll get you in for help as soon as possible. We look forward to helping you achieve both total oral wellness and the smile of your dreams. Please contact us today to schedule an appointment or ask questions. We can’t wait to serve you at the office of Rebecca L. Pounds.